Anthropology from a Pragmatic Point of View essentially reflects the last lectures Kant gave for his annual course in anthropology, which he taught from 1772 until his retirement in 1796. The lectures were published in 1798, with the largest first printing of any of Kant's works. Intended for a broad audience, they reveal not only Kant's unique contribution to the newly emerging discipline of anthropology, but also his desire to offer students a practical view of the world and of humanity's place in it. With its focus on what the human being 'as a free-acting being makes of himself or can and should make of himself,' the Anthropology also offers readers an application of some central elements of Kant's philosophy. This volume offers an annotated translation of the text by Robert B. Louden, together with an introduction by Manfred Kuehn that explores the context and themes of the lectures. Part I. Anthropological Didactic: Book I. On the cognitive faculty; Book II. On the feeling of pleasure and displeasure; Book III. On the faculty of desire; Part II. Anthropological Characteristic: A. On the character of the person; B. On the character of the sexes; C. On the character of peoples; D. On the character of the races; E. On the character of the species. 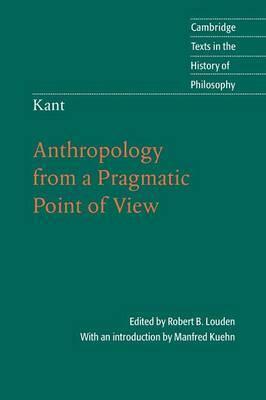 "This new, fully annotated translation of Kant's Anthropology from a Pragmatic Point of View is a welcome addition in light of the continuing focus among scholars on the question of whether empirical psychology is possible for Kant." Robert B. Louden is Professor of Philosophy at the University of Southern Maine. Manfred Kuehn is Professor of Philosophy at Boston University.